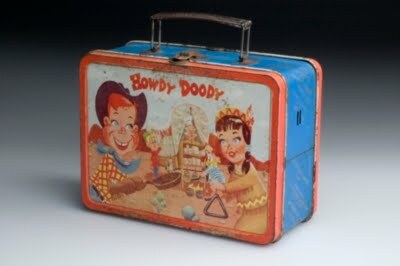 Like most of us who grew up in the 1950s, I often carried my lunch to school with me. It usually consisted of a sandwich, either peanut butter or bologna, a piece of fruit, and a cookie or two. The sandwich and the cookie were always wrapped in wax paper. I usually bought a half pint of milk at school for two cents, if memory serves, so I seldom carried a thermos. 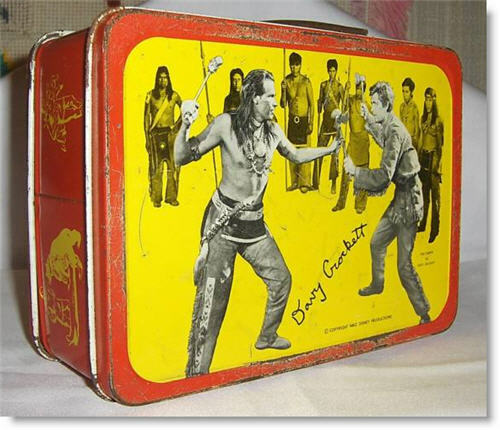 During all my years of grade school I carried one of two lunch boxes. One was an Alladin dome topped box finished in black crackle paint. The other was a square box, also made my Alladin, painted in a plaid pattern of predominately red and green. A lot of my classmates carried boxes that I envied more than my dull but utilitarian models. 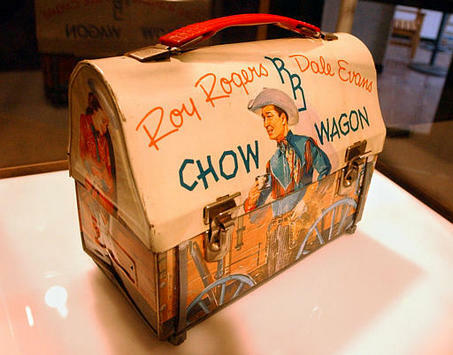 Some of the kids over the years had lunch boxes with pictures of Roy Rogers or Superman on them. Some with sports teams logos, and others with cartoon characters like The Jetsons or Rocky and Bullwinkle. Like much else from the ’50s, there is currently a lot of interest in these lunch boxes, with collectors driving up the prices to figures I would never have imagined. 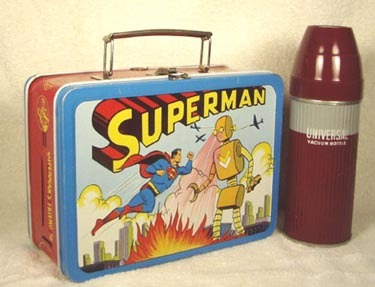 An unused Superman lunchbox and thermos from 1954 recently sold for $13,500 at a London auction. 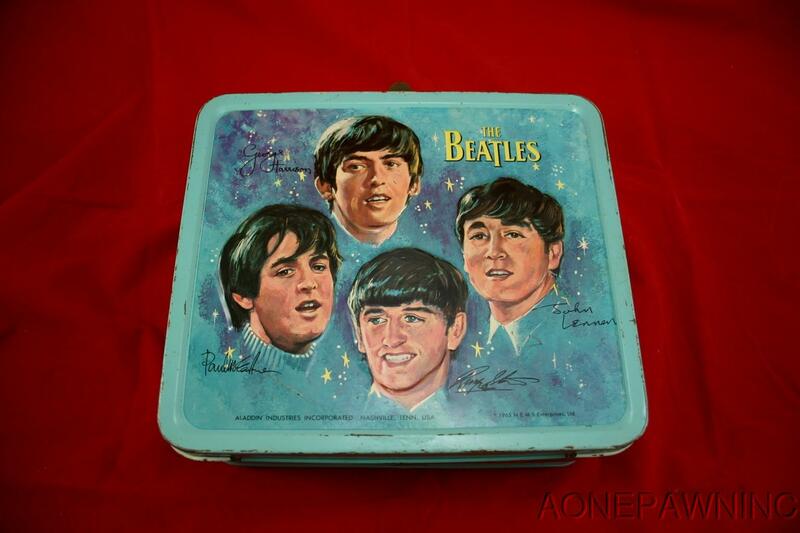 The same lunchbox that has been used but is still in very good condition routinely sells for $4000 to $5000. Even in fair condition they will bring $375 to $450. 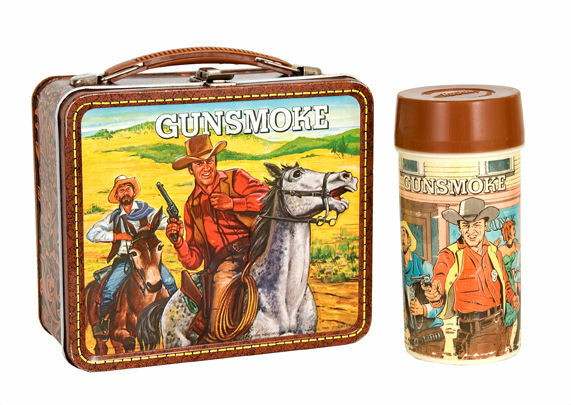 Lunchboxes from most of the TV western series from the ’50s, like Wild Bill Hickok, Gunsmoke, Wagon Train, or Bonanza fetch from $150 to well over $1000. 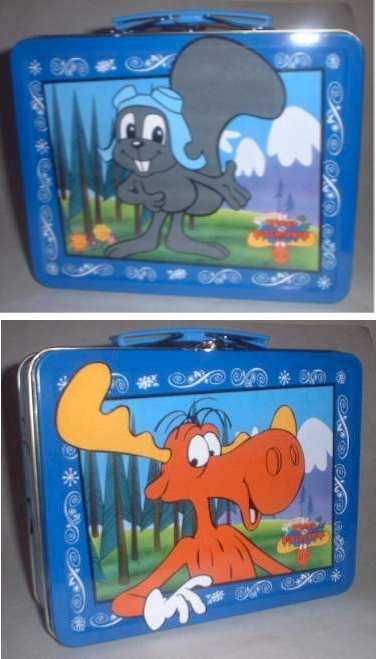 Either one of my ordinary, generic lunch boxes I used then would bring between $25 to $100 to a collector. A Toppie the Elephant lunchbox and thermos set, which you could get in the ’50s by redeeming Top Value Stamps, will easily set you back $3200. Any of these, Underdog, Dudley Do-Right, Jetson’s Dome, Beatles from 1966 or earlier, and Rocky and Bullwinkle are bringing in the range of $2500 to $3500 in excellent shape and with the appropriate thermos. Like all other collectibles, rarity, desirability, and condition drive the market place. The better shape one is in, the more you will typically pay. The better characters and more iconic TV shows or other logos on the box, the higher the prices. 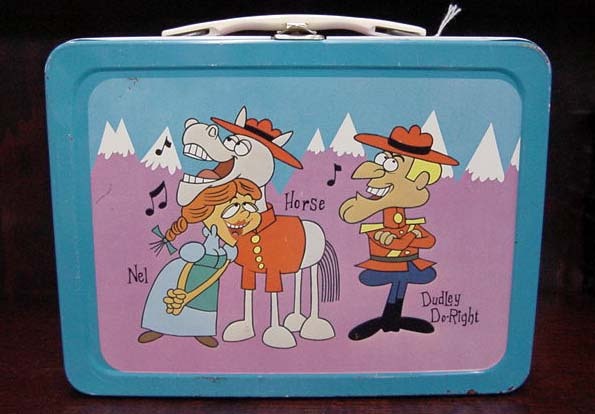 It’s an interesting area of collecting that most of us aren’t aware of, but which holds lots of nostalgia to we baby boomers who remember those days represented by these lunch boxes. I have only recently become conscious of the extent of sodium in the foods we consume. I have never had a propensity to use salt on food, and thought that I could have no problem with excess sodium. Come to find out, I was wrong. Salt that we add to food ourselves can be controlled quite easily. Don’t put a salt shaker on the table, don’t add salt to food as it’s being prepared, and stay away from known heavily salted foods, like potato chips and fast food french fries. But the problem is outside of our ability to handle by ourselves without a large amount of research, hunting for specific food brands, and other major modifications. This is due to the fact that nearly 80 percent of the salt in a typical American diet is put there by the manufacturers, not by us. About 12% of the sodium we consume comes from foods. Another 5% is added during cooking, while about 6% is added at the table. When I became sodium conscious a few months ago, we found out that the fat-free canned chili we had been eating for years, considering it a healthy alternative when our taste ran to chili, contains 2100 mg. of sodium per serving. The FDA daily recommended maximum allowance is less than 2,300 mg per day (about 1 tsp of table salt). The guidelines further recommend that blacks, persons with high blood pressure, and middle-aged and older adults consume no more than 1,500 mg per day (about 2/3 tsp of table salt). These specific populations account for about 70% of adults. The average daily sodium intake for Americans age 2 years and older is 3,436 mg. The maintenance level for human life and proper bodily function is about 185 mg per day. Further investigation disclosed that even so-called “low sodium” soups,canned under such sobriquets as “healthy choice”, “healthy request”, and other nice sounding names, contain between 480 and 900 mg. of sodium per serving. Why is this such a bad thing? It’s a known medical fact that an excess of sodium is linked to high blood pressure and consequently to stroke, the fourth leading cause of death and a major cause of disability in the US. Estimates vary, but some persuasively contend that excess sodium is the indirect cause of 150,000 premature deaths a year. In addition to the examples I gave above, salt is not necessarily where you expect it. Many popular breakfast cereals are more concentrated in sodium than you want your diet to be on average. If your breakfast cereal pulls your average salt intake up above guidelines, what are you going to eat to pull it down? The simple fact is that most of us exceed the guidelines every single day. This is made worse by the fact that many of us eat in restaurants on a regular basis, and they often exceed reasonable sodium levels even more egregiously than we see in the processed foods we prepare and eat at home. It has been found in a government study that some restaurant chains serve meals that contain enough sodium for four and a half days. Such meals are, quite simply, killing thousands of Americans every year, and adding to the strained healthcare budgets of which we are all aware. Not to single out these restaurants as the worst offenders, but to show a representative example of what the above study found. Red Lobsters Admiral’s Feast contains 7,106 mg of sodium. Chili’s Buffalo Chicken Fajitas has 6,916 mg. Olive Garden lasagna with a breadstick, garden fresh salad with house dressing has 6,176 mg. Most of us eat at fast food restaurants more than other types of eating establishments. We all know pretty well by now that fast food is not healthy food, and like most people, my concerns were always with the high amount of fats found in such fare. Just to open your eyes to the sodium question, here are some quick examples. A McDonald’s Double Cheeseburger will give you 1140 mg of sodium, and if you add a medium order of fries, you put another 330 mg of sodium into your system. You would then be more than half way to the RDA. You eat at Burger King instead of McDonald’s? That Whopper holds 1020 mg of sodium and an order of fries adds another 530, if you get them unsalted. You can have salt for another 140 mg. Maybe you’d rather have the BK Tendercrisp Chicken Sandwich. That would pack 1640 mg of sodium into your body. The fries would put you over 2000, and you’re staring at the RDA if you eat nothing else all day. Is Wendy’s better? Not so much. A Jr. Bacon Cheeseburger has 890 mg of sodium, but the Grilled Chicken Sandwich only has 740 mg. But if you have a salad with that, be aware that without dressing it only has 20 mg, but add Creamy Ranch dressing and the count jumps another 630 mg. Blue cheese dressing will hit you with 890 mg of sodium. But you can get a sour cream and chive baked potato for only 40 mg. The same potato with bacon and cheddar comes in at 870 mg.
Industry averages in a generic choice of restaurants will find the following statistics pretty common for these foods. A Reuben sandwich will typically top 3000 mg, while shrimp and rice with garlic sauce will come in just under 3000 mg. A serving of buffalo wings with blue cheese dressing will have around 2400 mg, the RDA in one meal. The average restaurant serving of spaghetti with meat sauce will also cost you the RDA on one plate, as will beef and cheese nachos. Four cheese sticks along with a cup of buffalo sauce will give you 2,920 mg. How’s that for an appetizer? Much of our everyday grocery store staples are surprising as well. Rice flake or wheat flake cereals contain around 1000 mg per serving, while puffed rice or wheat cereals contain around 4 mg. Why such a difference? No one has a good answer that I could find. Cheddar cheese has 620 mg per ounce, while Swiss cheese only has 260 mg. That parmesan that you sprinkle on your pasta? Each ounce will cost you 1862 mg of sodium. One cup of fresh cooked garden peas has 2 mg of sodium, while the same vegetable from the typical can will have 236 mg.
A single dill pickle can contain as much as 1428 mg of sodium, while a sweet pickle is less than 300 mg. Of course, a fresh garden cucumber contains around 2 mg.
A four ounce pork chop will contain 65 mg of sodium while four ounces of cured ham will hit you with 930 mg. Baked or boiled potatoes have between 2 and 6 mg of sodium each, while the same potato mashed and salted will give you around 300 mg. But then one ounce of potato chips is over 1000 mg.
Fresh baked salmon has 64 mg of sodium, whereas the same amount of salmon from a can will have 387 mg. While pork sausage has 958 mg of sodium, the normal pork frankfurter has 1100, and a slice of bologna has 1300 mg. The list can on and on, but I think you can see a pattern here. The less processed a food is, the less sodium it will ordinarily contain. Human beings have chosen through long and complicated evolution what foods they like and how they like them. Eons ago, the choice was made to pickle a cucumber in brine, and that healthy, tasty, cuke became a sodium loaded pickle. Of course this allowed the storage and consumption of cucumbers all year long rather than in the short growing season. The same can be said of smoked and salted meats, and such fare as sauerkraut with its 750 mg of sodium, whereas fresh cabbage with its negligible sodium content would not make it through the winter until the next year’s crop. So are today’s food really worse than those our ancestors chose to pickle, salt, and smoke for preservation? For the most part, I think the answer is yes. Since 1970, the average can of soup, for instance, has went from a sodium level of 280 mg per serving to over 800 mg. Pasta sauce has increased from around 200 mg to 650 mg. Even simple things like canned green beans have soared from an average then of 125 mg, to today’s average of 350 mg. The amount of sodium per serving has increased at the same time as our average per person consumption has soared, adding an even worse specter to the appalling facts. Since 1970 we have grown more obese, increased our consumption of fats, sodium, and all manner of preservatives, additives, and extraneous antibiotics and growth hormones. We have become a progressively sicker society, and one which will see our children and grandchildren have decreased life expectancy to that of our generation’s. The first time in recorded history to witness this sort of decrease in longevity. And it’s almost all due to what we eat. Americans spend north of $15 billion to treat high blood pressure, and many billions more on expensive heart procedures, yet the government spends peanuts improving Americans’ diets. Getting the food and restaurant industries to use less salt would be one way we could help prevent chronic disease and make health coverage more affordable. Reducing sodium consumption by just 25 percent over the next 10 years could save the government $9 billion a year in direct medical costs. Our love affair with dietary salt can probably be traced back to the very first creatures that dragged themselves out of the briny shallows onto dry land. Going terrestrial meant giving up a constant supply of sodium, and suddenly made the mineral a prized commodity. Deer will come to a salt lick with good reason. Sodium in nature is hard to find for creatures not swimming in it. The native, Stone Age human diet provided roughly 10 times as much potassium as sodium (we actually get more sodium than potassium in the typical, modern diet). Yet, sodium is essential. So those of our ancestors who craved it, and thus were motivated to get enough of it, did a better job of passing on their genes. After all, those who don’t survive to pass on genes make for very poor ancestors. Those of us around today inherited genes from salt-loving forefathers and foremothers. But in a world of limited sodium, their salt-cravings fostered their survival and procreation; in a world of French fries, Cheerios, and Bugles, our inherited salt craving fosters hypertension, stroke and osteoporosis. Taste buds are very malleable little fellas: when they can’t be with the foods they love, they learn to love the foods they’re with. Familiarity is one of the more potent drivers of dietary preference. The food industry case is that they are simply providing us the salt levels we prefer, and to some extent this is true. But we have learned to prefer such copious additions of salt to our diets because our taste buds are bathing in sodium excess all day long. It works just as well in the other direction: if the feds help dial down our exposure to sodium, we will get more sensitive to sodium, and prefer less. My taste buds are beneficiaries of a very pure, ‘practice of what I preach’ diet. There are health advocacy groups putting pressure on the government to put some controls on the manufactured food and restaurant industries to reduce the amount of salt in the foods they sell to us. I am in total accord with this effort. I only lament that they do not go far enough in what they are asking the government to do on our behalf. I can, however, imagine one vociferous protest to my position: isn’t this just one more example of ‘Big Brother’ telling us what to do? The answer comes down to your preferences for salt, siblings and shelf life. You see, salt content in processed foods has gone up for a number of reasons. Some research shows that the human appetite center is activated by combining multiple flavors at a time; I suspect that is at least part of the reason sweet cereals and desserts contain as much sodium as they do. Your preference for salt levels that are irrefutably at odds with your health, and the health of your children- is a by-product of native traits and tendencies from the Stone Age, clashing with modern food industry practices. I doubt you ‘want’ salty breakfast cereal, or cookies, but the industry is giving them to you, and manipulating your taste buds in the process. So, you are currently being bossed around, not by Capital Hill, but by Madison Avenue. Is that really better? In addition, and more obviously, salt extends shelf life. The longer foods go without spoiling, the less waste there is for the food company, and the higher the profits. But here’s the rub: by and large, the longer the shelf life of the foods people eat, the shorter the shelf life of the people eating the foods. So, it seems, the government should want to prioritize the shelf life of people over products, and arguably, any resistant elements in the food industry would rather go the other way. You can decide which of these platforms you prefer, but I’ve made my choice, and it seems a no-brainer to me! Since it is much easier to add salt to food than to take it out after someone else has added it, it seems to me that some regulation would put more control where the salt shaker is — in your hands. Big Brother has expressed no desire to take that shaker away. You can always add salt whenever you want. I doubt it will be when you are eating cookies, but you’re the boss. Isn’t that how it should be? In 1835 visionary Samuel Burnside built a saw mill on the banks of Crooked Creek in northeast LaGrange County. Peter Beisel decided to construct a grist mill nearby and use materials from Burnside’s mill to build his own mill. Unfortunately Beisel ran into financial trouble and could not complete the grist mill. The mill had to wait until 1846 to be completed by Amos Davis. The “jinxed old mill” spent half of a century being tossed around to different owners. When Henry Rinkel purchased it in 1904, the mill was being used as a dance hall because the Crooked Creek dam had been washed out months before. Skeptical neighbors assisted Rinkel for two long years with their picks and shovels. Extensive repairs were necessary at the obsolete mill. Finally, in 1906, Rinkel began producing “New Wrinkle” flour. The mill is still producing the same quality flour. However, now the flour is labeled “New Rinkel” and Crooked Creek has been renamed Fawn River. 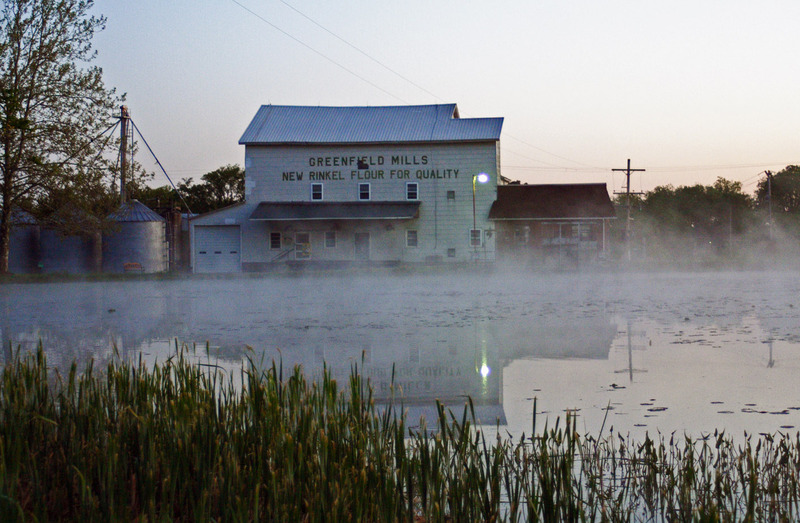 Since 1904, Greenfield Mills has been family-owned, passed along from father to son two times. Howard Rinkel is a third-generation owner. A fourth, fifth and sixth generation exist, though none are designated to take over the mill. While there were once hundreds of small wheat mills in Indiana, there are now only a handful left in the country. Rinkel explains that years ago grocery stores were family-owned, and customers baked from scratch. Now grocery stores are massive supermarket chains. Customers use mixes instead of flour. “It is a faster world now,” said Rinkel’s wife, Helen. In 1974, Howard, Howard’s father and Howard’s son David broke ground on a “New Mill” building just down the road from the “Old Mill.” The “New Mill” could produce the same amount of flour in one room that the old mill produced on four floors. For many years, the “New Mill” produced flour used to bread Kentucky Fried Chicken. But after Colonel Sanders’ death in the late 1980s, KFC changed its recipe and no longer used the soft winter wheat flour. The “New Mill” was approached by an Ohio company in 1975 about grinding organic buckwheat flour. Since then, Howard’s daughter, Joyce Rinkel, has taken over all of the organic business. The “New Mill” was OCIA certified in 1996 and now produces only organic flour. Today organic flour is Greenfield Mills’ most successful product. Semis carry out loads of 40,000 pounds about once a week. These loads are transported to Portsmouth, Ark., for the making of crackers. Greenfield Mills is the oldest commercial water-powered mill left in the state and the oldest business in LaGrange County. The mill is run by electricity produced by a water powered generator. There are also 11 neighboring homes that are powered by the private hydro-electric generator, making Greenfield Mills the smallest electric utility company in the state. The organic industry of the “New Mill” has the potential to carry on the success of Greenfield Mills for years to come. The Mill is now outfitted with a small country store where you can buy Rinkel products, including their bread flour, blueberry pancake mix, pumpkin spice pancake mix, and buckwheat and buttermilk pancake mixes. Their biggest seller is their Hearts of Wheat Cereal. They also sell other locally made and grown products from Northern Indiana and Southern Michigan including Crabill Farms Barbeque sauces, and organic honey, as well as Indiana maple syrup. The family of a Puerto Rican man, who died of a gunshot wound last week, opted to follow his wishes and gave him a funeral his friends will long remember. Instead of being embalmed and placed in a casket so his loved ones can view his body, 22-year-old David Morales Colon was prepared by morticians and positioned on his motorcycle. 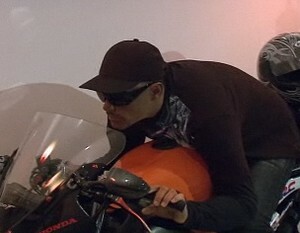 Colon’s body was dressed in full riding attire–leather jacket, sunglasses and cap. His hands were on the handlebars and it looked as though he was cutting the wind as he sped down the highway. Colon instructed his family that if he was ever killed, to forgo a traditional funeral with a casket and prop him up on his bike, a Honda CBR600 F4. Colon was shot to death April 22. According to friends, seeing Colon on his bike, as he often looked as he zipped through the streets of San Juan, was fitting. 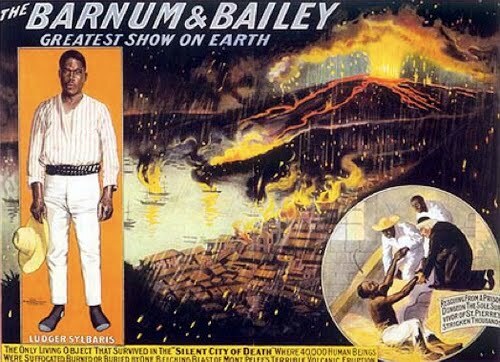 98 years ago, there was a terrible volcanic eruption on Martinique, an island in the Caribbean. 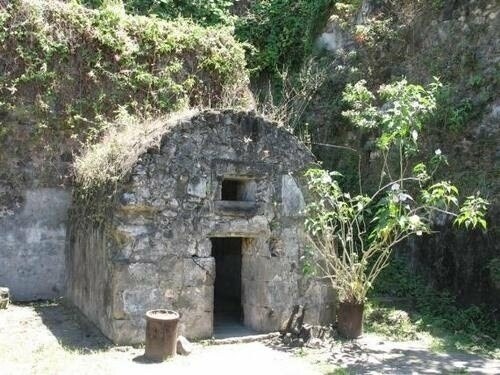 What’s been dubbed as the worst volcanic disaster of the 20th century, it killed all residents—except the sole drunk in this prison. Two other Martinique residents survived also, a girl who sailed a boat into the ocean and a shoemaker who also lived to tell the tale, by falling into the ocean. Ludger Sylbaris, however, survived because of his fondness for drink—he’d been arrested and was thrown in the simple stone prison, which has just a slit for air. The Mount Pelee eruption swept throughout the city, with all residents being burned to death, killing over 30,000 people in total. Four days after the eruption, Sylbaris was found by rescuers, who heard him through the stone walls, and despite his lungs being burned due to the 1,000+ degree heat, he survived thanks to his prison.